A lifeboat had to be put on standby after a bulk tanker carrying more than 5,000 tonnes of sulphuric acid was left drifting near Orkney. The Maltese-registered West Sailor ignored advice from the coastguard and anchored in the Pentland Firth to carry out repairs. But gale-force winds meant the ship, which was involved in another incident two months ago, started to drift. The incident has led to calls to increase coastguard powers. 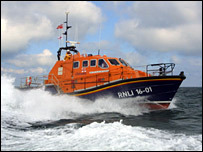 The Longhope lifeboat stood by as the 26-year-old ship dropped anchor in the firth at about 1000 BST on Saturday morning. The ship's master informed coastguards that he intended to stop in the Pentland Firth to carry out repairs on the cooling system. They advised him that he should steam out of the firth before attempting the repairs. In April, the ship's engine room caught fire off the coast of Ireland. Orkney MP Alistair Carmichael said he wanted to see the coastguards given powers to order the master not to stop his engines when it could place the ship and the local environment in danger.